Hays works through the storyline of Scripture from Genesis to Revelation to trace God’s dwelling places with humanity. Alluding to Mark 13:1, Hays wants to “move beyond the ‘stones’ to grasp the eternal theological truths being revealed to us about God”. Chapter 1 begins with an introductory overview of the book as well as the tabernacle and temples. From there, chapter 2 presents the idea that Eden was the first temple. Chapter 3 explains the construction of the ark and the tabernacle. Chapter 4 then turns to Solomon’s temple. Chapter 5 covers issues such as the cherubim and the Lord’s departure from the temple in the exile and promised return in the prophets. Chapter 6 describes the second temple, as recorded in the latter Old Testament as well as historical accounts and inter-canonical texts. Chapter 7 then explores the theological development of the temple in the New Testament in light of Christ’s identification as God’s temple, and the church’s description as the temple of God. Chapter 8 concludes the book. One may feel that this territory has been well-covered before by others. While it is true that some like Beale and Walton have said much about the temple, Hays’ work has a unique role. Compared to a work like Beale’s monolithic The Temple and the Church’s Mission, Hays’ The Temple and Tabernacle is more introductory, big-picture, concise, and slick. That is not the diet version of Beale’s work; far from it. They both serve different purposes. Though not radically different in content, this is much more comprehensive in its description of the tabernacle and temples. An exceptional feature of The Temple and Tabernacle is the abundance of illustrations and archaeological photography; these are alone worthy of the price of the book and are a huge help towards understanding. Throughout the book, Hays provides detailed but readable description of the tabernacle/temple’s architecture and furnishings. He also aptly summarizes the inter-canonical history for the second temple. Most chapters succinctly develop theological relevance as well. A few things are worthy of note, however. First, I wished Hays had developed more space to the temple intertextuality found in Revelation 21-22 indicating all the temple hopes in the OT find their fulfillment here. Second, Hays intriguingly argues for a negative interpretation of Solomon’s temple-building process. For Hays, Solomon’s spiritual decline begins earlier than is commonly believed. His argument is compelling at points, but to my eyes he takes up far too much space in the book and this distracts from his overall goal. Virtually every element of Solomon’s temple is read as revealing poor motives on his part. It seems to me this is not the place to make such a sustained argument. Hays could have simply abbreviated his best arguments with a note pointing to a fuller development elsewhere. 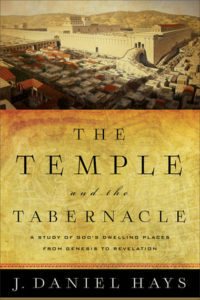 The Temple and Tabernacle is an architectural and theological survey of Israel’s the tabernacle and temples that is informed by the latest archaeology and scholarship. While all will enjoy using this as a resource for archaeological, theological and and archaeological information on the temple, it is particularly suited as an introduction. If one wanted a clear and comprehensive introduction to the purpose, architecture and theological development of the tabernacle/temples across Scripture, this is the first book I would recommend. As I read a pre-publication edition of this book, some details, such as page numbers, are likely to change. In particular, all the images were not placed within the body of the book, so I am unable to comment on their placement and how this affects the flow of the book. Many thanks to Baker Academic for providing a review copy through Netgalley.